Sony introduces three new iPod docks | What Hi-Fi? 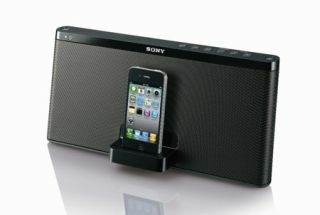 Sony has unveiled a trio of new iPod docks, due on sale from June/July, priced from £70 to £180. All three models are compatible with the iPhone 4 and fourth-generation iPod Touch. The Sony RDP-X60iP (£180) has wireless Bluetooth streaming and 20W power, while the 10W RDP-M15iP (£129) is a portable unit with a swivelling bracket so you can view your iPhone/iPod in vertical or horizontal mode, and its rechargeable battery delivers up to six hours playback. Finally there's the compact RDP-M5iP (£70), available in black or white, which runs on four AAA alkaline batteries for up to 10 hours.